Have you ever wanted to start a small business? Have you ever thought it was tough to do so? Unsure of how to get it started? I completely understand your confusion and fears. There's so much information out there on the Internet and so many self-help gurus that it either takes time to put all the information together or you have to pay top dollar to have a guru explain it to you. 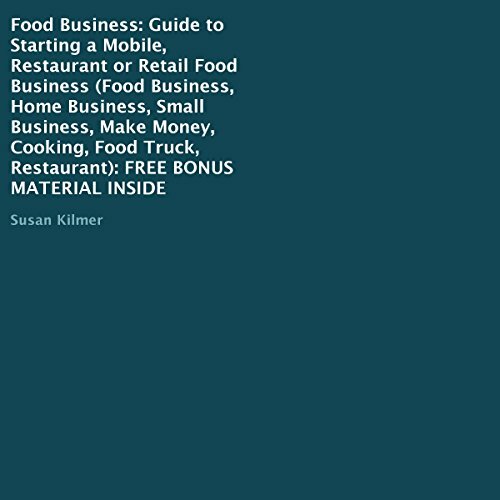 My name is Susan Kilmer, and I am the author of this "starting a business" guide. Over the course of my business and entrepreneurship background, I have taught hundreds of aspiring entrepreneurs how to start a business and business owners how to keep their businesses going, and the one thing they have all said at one time or another is, "I wish there was some manual or guide that would walk me through the steps of what I need to know to start and operate my business." I listened, and I did it. I created this concise guide on how you can start a business. How to assess yourself. Are you truly prepared? How to develop a strong business idea. How to research if your business idea could fit. Business loans and funding options: What do banks want? How do I start, and what permits and licenses do I need? This has pretty basic but good information. My problem with it was the Narrator. I felt like I was being yelled at the whole time I listened. It was not the kind of voice that helped me to get engaged and pay attention to the topic. Quite basic, consists of several books which overlap a lot. Content is very basic and general, it does outline useful principles though.